Dr. Mahdi Ahouie, University of Tehran: Radicalization of State-centered Power Politics in the Middle East and Polarization of the Islamic Ummah: What is the Way Out? While examining the consequences and residues of imperial and neo-imperial presences, this conference is an attempt to explore the historical and contemporary role of religion and politics in the current crisis. Recognizing that Islam is at the core of these debates and discussions, this conference looks into key issues including Muslim identity, extremism, violence and human right violation. While addressing these challenging issues of the escalating violence and the humanitarian crisis, it explores and analyzes the regions’ domestic and international politics and current concerns including sectarianism and persistent authoritarianism. 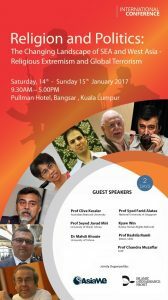 Radicalization of State-centered Power Politics in the Middle East and Polarization of the Islamic Ummah: What is the Way Out? Professor Seyed Javad Miri is a visiting professor in human sciences and philosophy at the Institute for Humanities and Cultural Studies. He is also editor of The Islamic Perspective Journal. He founded the World Association of Allama Jafari Studies in 2014 in the USA. The association is devoted to revive the discourse of contemporary Iranian wisdom philosophers in US and Europe. Miri received his bachelor and master degrees at Goteborg University in Sweden and then moved in 1998 to England where he got his doctoral degree in collaboration with Gregor McLennan at Bristol University in the department of sociology. There he worked on the question of social theory based on an intercivilizational dialogue by comparing the sacred and secular intellectual traditions in the works of Ali Shariati and Allama Iqbal (from the primordial intellectual tradition) and Giddens and Goffman (from the modernist intellectual tradition). He has been teaching and living since 2004 in China, Russia and currently working in Tehran. He has published several books and over 50 articles both in the U.S. and U.K. on various issues related to social theory, philosophy and religion from a transcendental point of departure. Dr Mahdi Ahouie is the Director of the Iranian Studies Programme at the University of Tehran, University of Tehran. He has received a PhD in International Relations from the Graduate Institute of International and Development Studies – University of Geneva, Switzerland. He also holds a Masters degree from the University of Geneva specializing in international history and politics, and a BA from the School of International Relations in Tehran. He has worked as a research fellow at several educational and research institutions in Iran and in Switzerland, including the International Centre for Geopolitical Studies in Geneva, and the Institute for Political and International Studies in Tehran. 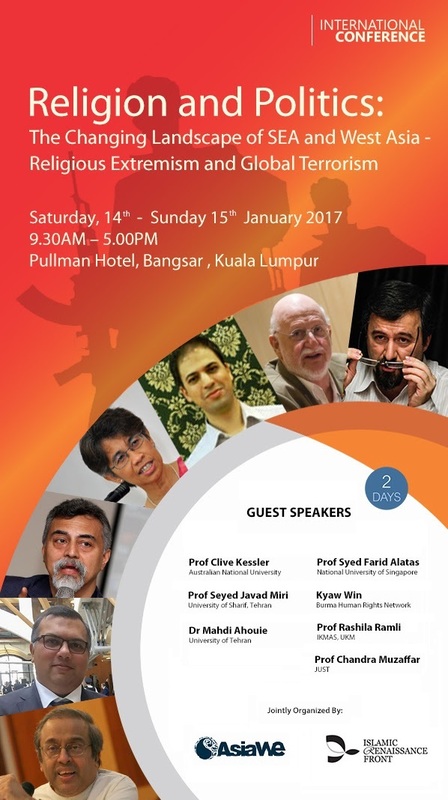 Dr Syed Farid Alatas, is an Associate Professor of Sociology at the National University of Singapore (NUS). He also headed the Department of Malay Studies at NUS from 2007 to 2013. He lectured at the University of Malaya in the Department of Southeast Asian Studies prior to joining NUS. His areas of interest are historical sociology, the sociology of social science, the sociology of religion and inter-religious dialogue. Among his recent books are Alternative Discourse in Asian Social Science: Responses to Eurocentrism (Sage, 2006), Ibn Khaldun and few others. He is the Academic Advisory Board for the Asia West East Institute. Kyaw Win is the Secretary of Burmese Muslim Association and Executive Director of the Burma Human Right Network, London based human rights organisation since 2012 that playing a crucial role advocating for minority rights and religious freedom in Burma. This non-profit organisation dedicated to report human rights violations in Burma including religious freedom and minority rights, and advocate international community regarding human rights violations in Burma. Dr Chandra Muzaffar is both a social activist and an academic. He is the President of the International Movement for a Just World (JUST), an international NGO based in Malaysia, which seeks to critique global injustice and to develop an alternative vision of a just and compassionate civilization guided by universal spiritual and moral values. He has published extensively on civilizational dialogue, international politics, religion, human rights and Malaysian society.